HOW DO I TRAVEL WITH MY PET? I AM GOING HOME TO THE PROVINCE/GOING ON VACATION AND I WANT TO BRING MY PET. Section 4. It shall be the duty of any owner or operator of any land, air or water public utility transporting pet, wildlife and all other animals to provide in all cases adequate, clean and sanitary facilities for the safe conveyance and delivery thereof to their consignee at the place of consignment. They shall provide sufficient food and water for such animals while in transit for more than twelve (12) hours or whenever necessary. No public utility shall transport any such animal without a written permit from the Director of the Bureau of Animal Industry or his/her authorized representative. No cruel confinement or restraint shall be made on such animals while being transported. Any form of cruelty shall be penalized even if the transporter has obtained a permit from the Bureau of Animal Industry. Cruelty in transporting includes overcrowding, placing of animals in the trunks or under the hood trunks of the vehicles. If you know firsthand that the bus company violates The Animal Welfare Act by placing pets under the bus in luggage compartments, get the complete name of the bus representative who gave this information and send this and the name of the bus company and address to our email - kindly refer to the FAQ on How To Report Animal Cruelty. HOW TO GET A LOCAL TRANSPORT PERMIT FOR YOUR PET. What are the requirements for Dogs & Cats? - The animal should be 2 months old and above. - The rabies vaccination certificate must be presented. - The animal should have been vaccinated not more than one (1) year of age and not less than fourteen (14) days from the time of vaccination. 6. Have a safe flight! Call the bus company and find out what their policy is on the carriage of live animals. Ask where your dog/cat will be placed during the bus ride. Make sure you get the name and position of the person you spoke to so you can refer to that person whenever you need to. Unless they have a separate hold for live animals that has proper ventilation and temperature control and is protected from other cargo, request that you be allowed to keep the dog/cat in the bus cabin with you on the seat beside you. DO NOT ALLOW YOUR PET TO BE PLACED IN THE COMPARTMENT UNDERNEATH THE BUS - THIS IS CRUEL AND NOT SAFE FOR YOUR PET. You may need to buy two tickets and choose a seat at the back so your dog/cat does not have to deal with too any people, and they do not have to be overly concerned by it. If your pet is in the cabin with you, make sure it is on the window side of the row, with you on the aisle side or you may want to use a muzzle to ensure the other passengers are comfortable. If your dog/cat is not in a crate/carrier (though we highly advise you use one): KEEP HIM ON LEASH, WITH THE LEASH IN YOUR HAND, AT ALL TIMES. If you use a muzzle on your pet dog, you will need to get one that will allow the dog to pant and drink water. You will also need to train the dog to be comfortable with it for a long duration. Some amount of training will be required. Make sure you potty your dog, give him water and allowed him to walk around and stretch a bit before and after the bus ride. Have your vaccination records with you at all times. Keep your pet's collar and name tag on while your dog is in the crate/carrier. If they bus company has a separate hold for live animals, check to see that it has proper ventilation, that it is protected from other cargo - you can not have other cargo slamming into the crate, or covering it, or blocking the ventilation. Your dog should be the last one into the hold and the first one out - Ask about this policy from the bus company. Watch them as they load your dog. Watch them as they unload your dog. At every stop, check on your pet, its ventilation, and if it needs water. If the bus is not scheduled to stop - request that it stop at least half way so you can check on your dog. On arrival, take your dog out of the crate or remove the muzzle, give it water and let it walk around and potty. Make sure your dog is on leash at all times when not in the crate. Because you will be taking a bus, I suggest you use a hard shell crate rather than a wire crate. It offers your dog more protection. In early 2013, PAWS sent letters to the bus companies as an information campaign/reminder that pets and live animals placed in the compartments is a violation of RA8485 since there is no proper ventilation after receiving reports from pet owners whose pets have suffered from such travel. We also provided suggestions on how they (the bus companies) could set aside conditions/requirements that pet owners must agree to before allowing pets inside the vehicle. It's possible that the bus companies do not want the hassle of exerting the effort to enforce such conditions and accommodate travelers with pets or do not want to be bothered with the risk of pets making a mess inside and/or disturbing other passengers (unfortunate examples possibly made by irresponsible pet owners) and so they banned pets outright. You may inquire with bus companies that do not have "No Pets Allowed" signs explicitly posted and appeal if they will allow you to travel, with an offer to pay for the extra seat next to you for your pet. Another alternative is to travel in a non-airconditioned bus. 1. Call the airlines and inquire about their policies for flying live animals. 2. 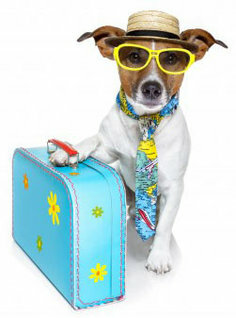 Choose the airline that satisfies your concerns regarding your pet's air travel and choose your flight. 3. Before booking the flight, call the airline. Ask if the specific plane used for the flight you have chosen can take live animals such as the one you plan to bring with you. If it can, inform the airlines that you will be taking live animals on board – let them know what kind, what size, and how many. 4. Ask the airline where your pet will be off loaded at the destination – whether on the baggage conveyor belt in the arrival section of your destination terminal, or at some other place like the cargo building at the destination airport. Make the necessary arrangements at your destination to ensure you can collect your pet. 5. You can now book your flight. 6. Dogs and cats need to be in hard shell or wire crates. b. The wire door must have a crate bowl clipped on to facilitate watering and feeding without need for opening the door. It should also have a lock or must be secured with cable ties just before the pets are taken for loading. c. The crate must be large enough for your pet to sit and stand up in, and to turn around in. 7. You have a choice of checking your pet in at the cargo building (in Manila, go to the old domestic airport), or at the passenger terminal check-in counter. a. Either way your pet will be loaded in the live-cargo hold of the plane. b. If you check your pet in at the cargo building you pay less and you will need to leave your pet there before you plan to check yourself in. Give yourself an hour to complete your pet’s check-in. c. If you check your pet in at the passenger terminal, you will pay more and your pet can stay with you until you go to the pre-departure area. Unless your pet is absolutely and reliably well behaved, I suggest you keep it crated. Before you go to the pre-departure area, you will need to hand your pet over to the cargo agent who will ensure your pet is taken directly to the plane at loading time. d. Fees will be based on weight and crate size. g. put your dog’s collar and tag on it. 9. On checking your pet in, first get the quarantine officer’s permit to transport your pet. Then you fill out forms, have your pet weighed and measured, and pay the fees. Check your waybills to ensure correct information, and ensure all the labels, flight details, live animal notices and transport stickers are stuck to the crate. 10. Request that your pet be transported on the same flight you are on. Be sure to get the airline’s assurance that this will be done. 11. Make sure your pet’s collar and tag are secure on it. Place the leash in your bag and keep it there. 12. As you board the plane, ask the flight attendant standing at the plane door to check whether the pilot has been notified that your pet is on board. If he has not been notified, ask why and insist that they check the whereabouts of your pet. Unless the pilot is notified of live animals on board, he will not ensure proper pressurizing and temperature control in the live cargo hold. 13. On arrival, collect your luggage and proceed to collect your pet. Have your waybill and ID ready to show to the cargo handlers. DO NOT sign anything that says you have received your pet in good condition until you have actually received your pet, inspected it, and are satisfied with its condition. 14. When your pet arrives in its crate, prepare your leash, open the crate door and leash your pet, take it out to potty and for a drink of water. Inspect it. Sign the necessary papers. Collect your crate and go home. Crate train your pet so it is comfortable staying in the crate for long periods. Rescue Remedy effectively calms your pet for the flight. Thunder shirts are also effective calming tools. You may line the crate floor with the dog's bed but Do not leave the leash inside the crate or attached to the dog as this may entangle him and cause injury or death. AS OF 2015, PAWS Director Elsie's personal choice is PAL. Sheba (PAWS Director Elsie's dog) is an aspin, 18 inches at the withers. To get her from Manila to Cebu on PAL, I checked her in at the passenger terminal. I paid twice the cost of my round trip ticket. I think I would have paid about as much for the same arrangement on Cebu Pacific. To get her from Manila to Davao on Cebu Pacific, I checked her in at the Cebu Pacific Cargo building. I paid one half of my round trip ticket. I think I would have paid about as much for the same arrangement on PAL."